Elyse and Tyler were married on Saturday, June 10, 2017 at Loflin Yard in Memphis, Tennessee. Since I have been planning and coordinating weddings, this is by far the best moment I have ever witnessed and therefore wanted to share the experience here. I rarely tear up at weddings, but this moment was so overwhelming with emotions it gave me all the feels and chills! Although they both live in Memphis now, Elyse is originally from New Orleans. When Tyler and Elyse first started dating, Tyler was traveling a lot down to New Orleans to see Elyse. Eventually she relocated to Memphis to be with Tyler and continue her career in a new place. After a short amount of time, they became engaged and Elyse spent a year planning her perfect day. Now, Elyse is a perfectionist and was very hands on in all her planning, but unbeknownst to her there would be a surprise at her wedding she would never forget. Elyse’s bridesmaids started contacting me a couple months before the big day asking me to assist them with a special gift they were planning and to keep it very hush, hush. They were arranging a surprise second line band, a true New Orleans past time, to appear during the reception. As a tradition in New Orleans weddings, a second line band celebrates the newlyweds as they embark on a new life together. The main line leading the parade for a wedding is made up of the married couple, the brass band and usually a grand marshal. The second line is the wedding party and any passersby who want to join the celebration. 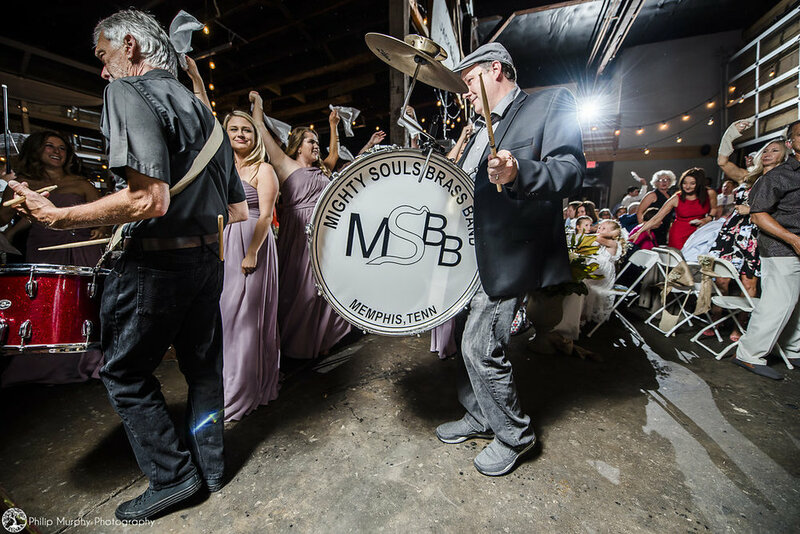 Elyse’s bridesmaids contacted Memphis based Mighty Souls Brass Band and the planning began. It proved to be an intense process with city permits, parameters on the street the band could and could not form the line in, somewhere to “hide” the band as they practiced/tuned up before the performance…etc. A long process, a lot of coordinating…but totally worth it to see the looks on Tyler and Elyse’s faces! 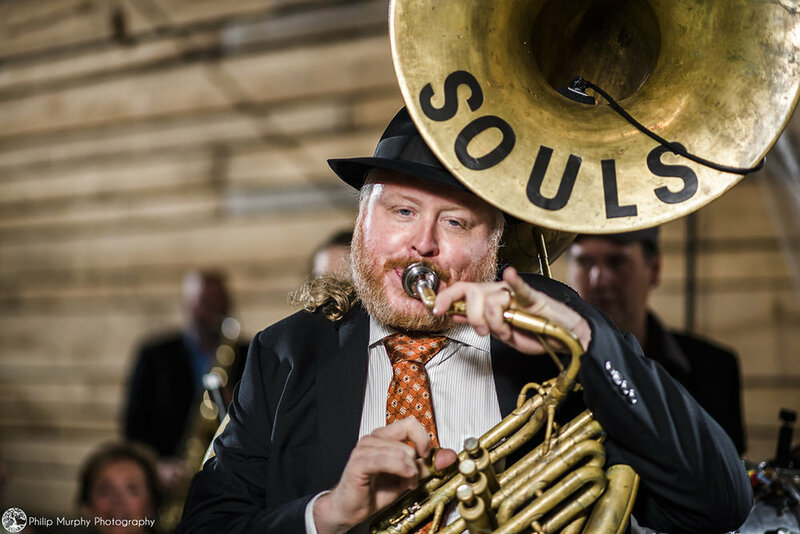 The Mighty Souls Brass Band emerged from the kitchen and the guests went wild! Elyse and Tyler’s faces were priceless and of course, everyone joined in, waving handkerchiefs and parading around the building outside. The venue itself is actually a very popular bar restaurant in Memphis, so guests of the venue joined in as well. It was a sight to see and not one frequently seen in Memphis! I wish Elyse and Tyler the best for the future and know they will cherish their special surprise moment for years to come Take a look below at more scenes from this amazing moment! A big THANK YOU to Philip Murphy Photography for sharing these images with us. Philip can be contacted on his website here. Photo by Philip Murphy Photography.